Can foot pronation cause knee pain? What effect do feet have on knees? Can bad feet cause bad knees? Why do my kneecaps hurt when I walk down stairs? What are the causes of mal-tracking patella / lateral tracking patella syndrome? What is chondromalacia patella and why did I get it? To understand chondromalacia patella (CMP), it is helpful to know just a little about the anatomy of the knee joints and the thigh muscles . The patella bone, commonly known as the kneecap, has a ‘V’ shaped bump on its rear surface and the femur or thighbone has a V shaped groove on its front surface. Each of these areas are coated in the joint lining material called cartilage which is quite slippery to facilitate smooth gliding of the joint. Two main muscles that are part of the quadriceps group on the front of the thigh ideally work to pull the kneecap straight up and down in line with the groove when the knee joint is functioning well. These muscles are called Vastus Medialis and Vastus Lateralis. When your knee function is not perfect and you develop chondromalacia patella, the underlying problem is the physics of the angle of pull of the two Vasti muscles. Straight alignment of the muscles’ start and finish point with the direction and location of the groove will mean that the patella goes up and down the femoral groove in a straight line without wanting to pull off to one side. When we see patients who have developed chondromalacia patella, one of the first things we look for an excessive rolling in of the foot called pronation. The altered physics of this foot position means that the outside Vastus muscle can pull with a lot more strength than the inside one can and so it ends up doing much of work. The outside muscle then gets stronger while the inner Vastus muscle grows weaker due to being underworked. The result of this is that, when you take a step and the muscles contract, the kneecap runs off its course within the groove. 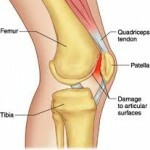 This irritates and wears away the cartilage on one side of the patellofemoral (kneecap/thighbone) joint, causing pain. During a podiatry examination, the podiatrist will most likely have you perform a contraction of the thigh muscles to assess what path the patella takes in its usual pattern of movement. If the kneecap tried to move out of the groove as it is drawn upwards by the muscular contraction, it is likely that this is the cause of the knee pain. You will be able to see this occurring for yourself once you know what you are looking for. People who have chondromalacia patella usually describe the pain as being around the edges of the kneecaps or ‘up and under’ the bottom edge of the patella. Often the swelling within the joint causes the area to feel full or tight. In some people, a piece of fibrous tissue called the retinaculum that helps to keep the kneecap properly positioned becomes stressed as it works hard to keep the kneecap from going too far and dislocating. This leads to a more spread out pain in an area below the kneecap and off to the inside edge. This condition is often not picked up by people who don’t see knees a lot but usually settles well once the kneecap muscle function is made more even. For more information of foot related knee pain, please browse to our Kneecap Pain Info Sheet. Alternately, use this link to return to our Podiatry FAQs Blog.